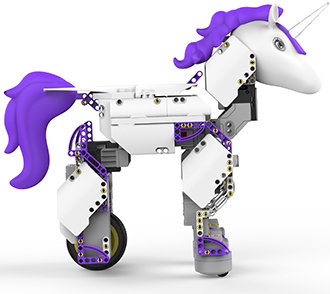 Build, code and create a magical UnicornBot. 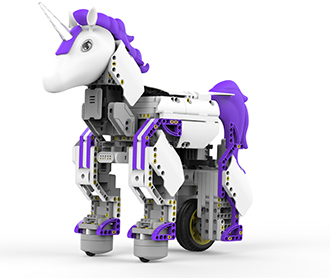 Unicorns are no longer just a figment of your imagination with this programmable robot kit. This enchanted kit has everything needed to create a buildable, codable robot or invent your own. Learn to use Blockly coding to program UnicornBot. Control horn colors, create emotions, navigate obstacles and more. The PRP (Pose, Record, Play) function lets you create entirely new, custom actions for your UnicornBot. 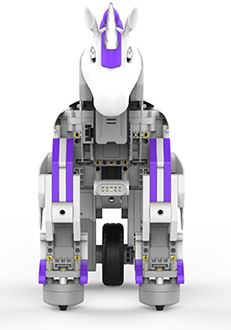 Building and coding UnicornBot introduces kids to STEM learning (Science, Technology, Engineering, Math) at an early age. The programmable LED horn adds a pop of personality to your UnicornBot with several different color options. The 3D, 360° animated instruction in the free JIMU app walk users through the building steps. Simply follow the easy step-by-step 3D, 360° instructions found on the Jimu Robot App to get started. Programming new actions is easy to do with our PRP (Pose Record, Play) system. Simply pose, record and play. Another way to program your Jimu Robot is with Blockly coding. You can create simple to complex sequences. See how easy it is to build and code your very own unicorn.